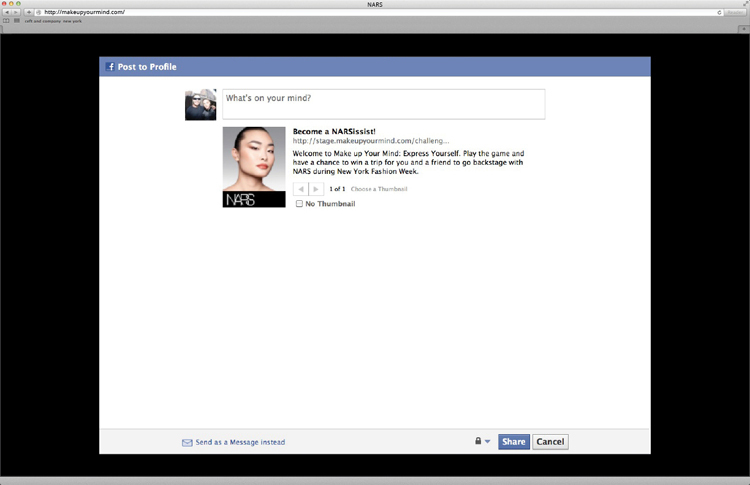 fully integrated with facebook, the social media site will auto post entries on facebook. 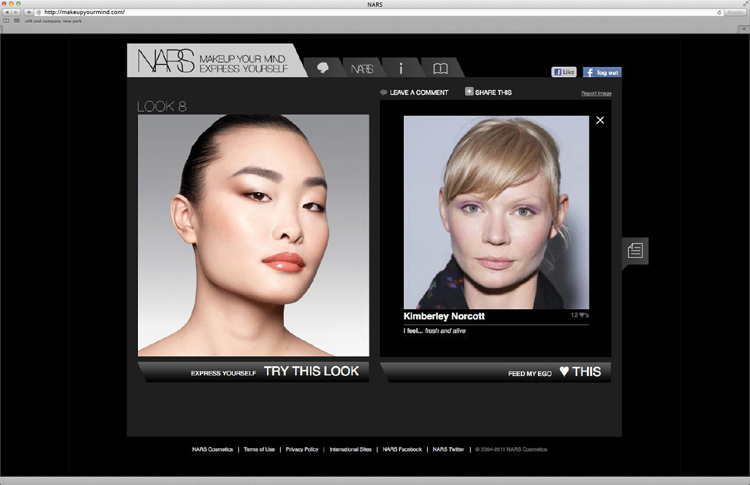 the face-pile module allows users to see like-minded friends who have also joined the experience. 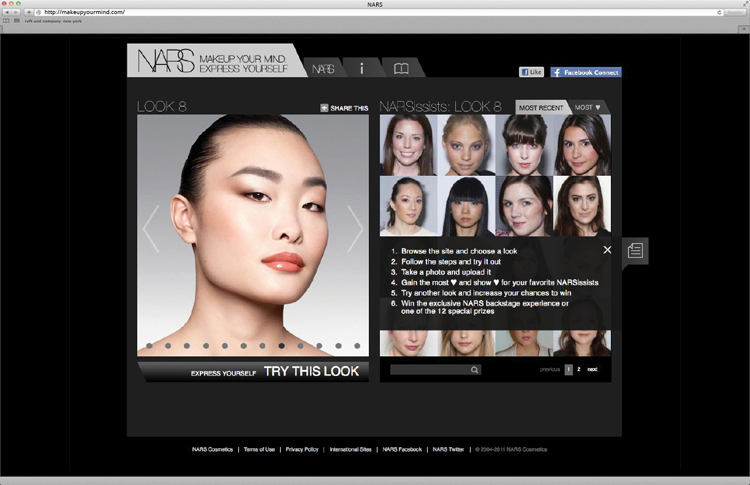 social media modules allow users to invite friends to the challenge or upload an entry image with comments. 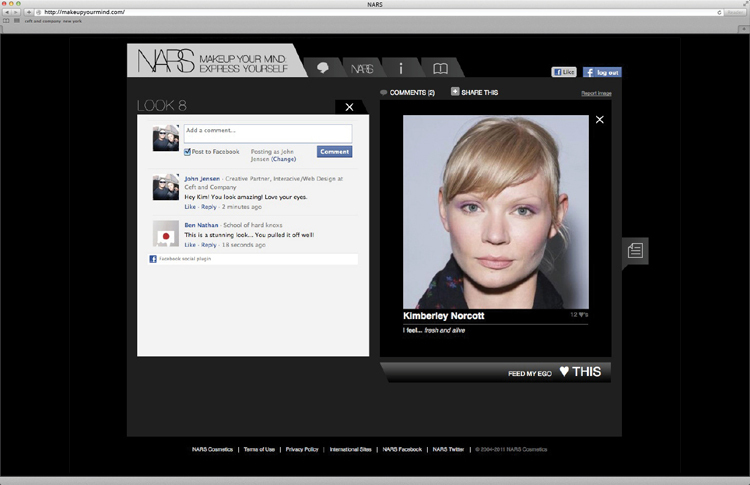 posted comments on the NARS site can be shared on facebook. 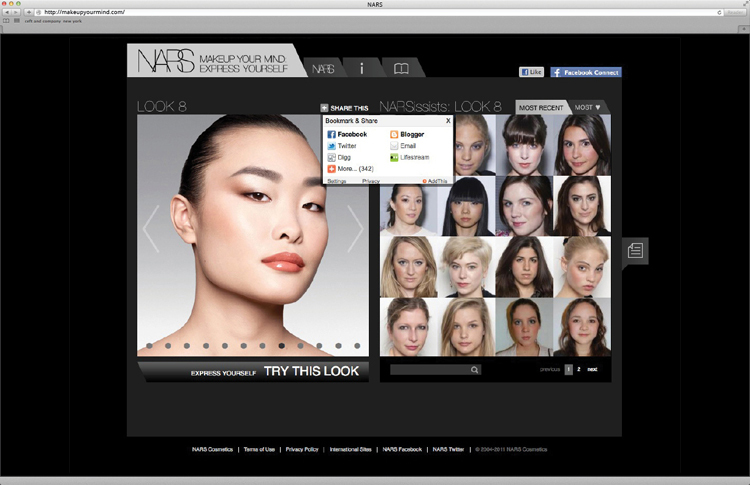 products related to achieving a look are gracefully integrated and linked to the e-commerce site. 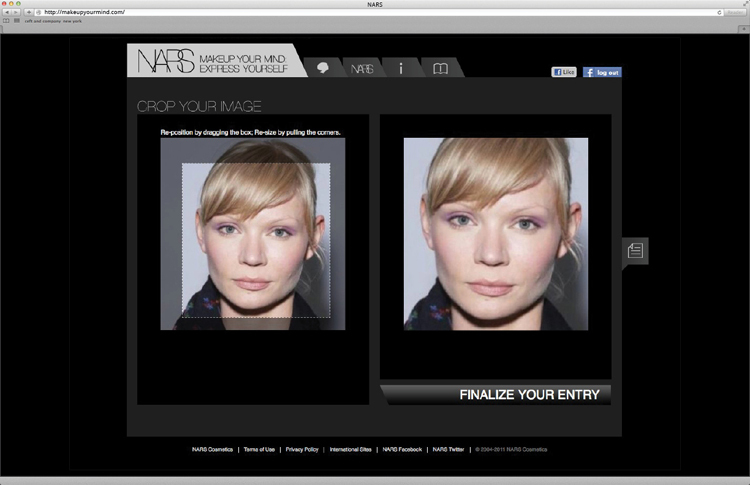 custom cropping tool will allow users to crop photographs as desired. 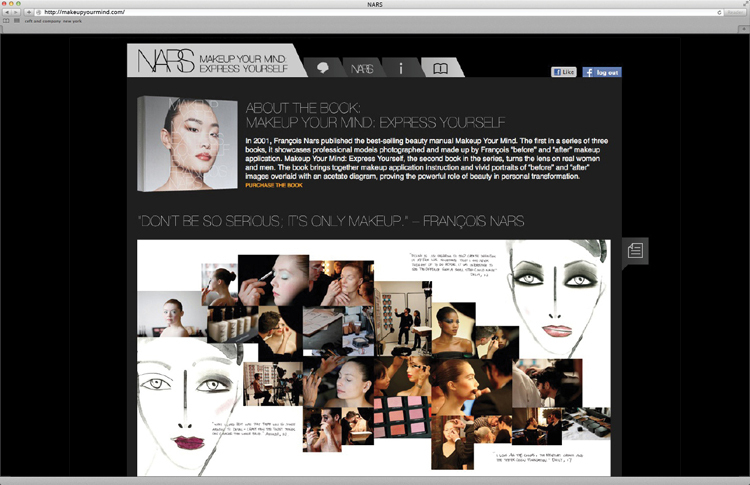 about the instructional book, “makeup your mind: express yourself”. 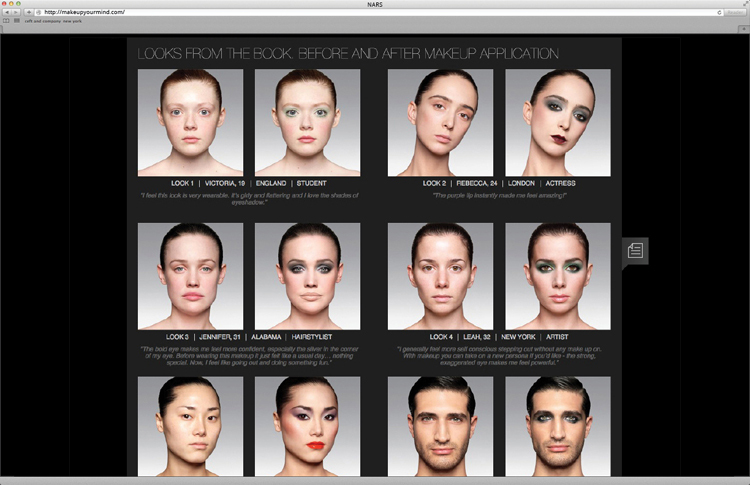 12 looks are available in the book, and linked to each of the challenges on the site. 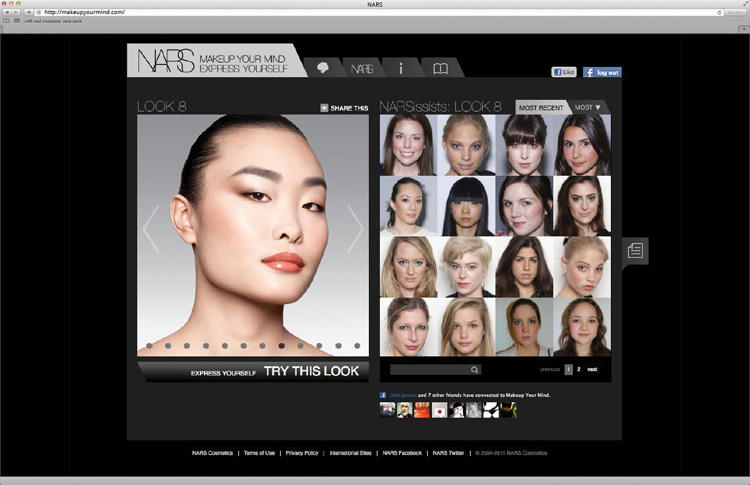 the website (www.makeupyourmind.com) designed and produced by ceft and company new york was the answer to NARS’ desire to broaden its audience and create a presence in the social media world. 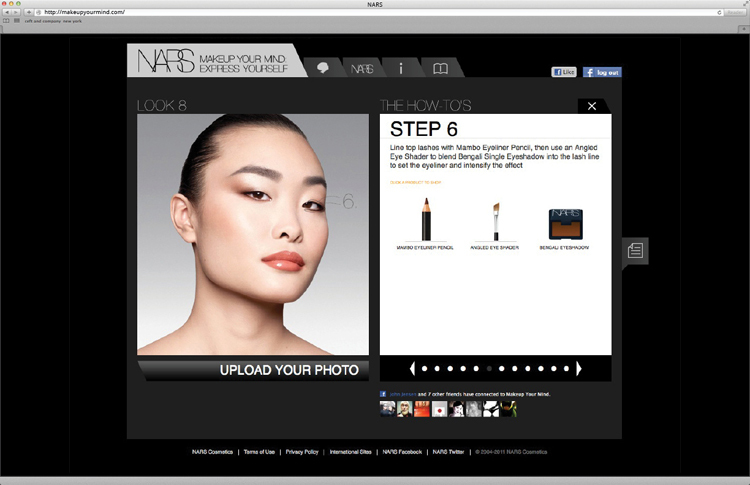 the website, which marks the shiseido-owned company’s largest digital initiative to date, contains 12 step-by-step tutorials adapted from the pages of the book by francois nars, “makeup your mind: express yourself”. 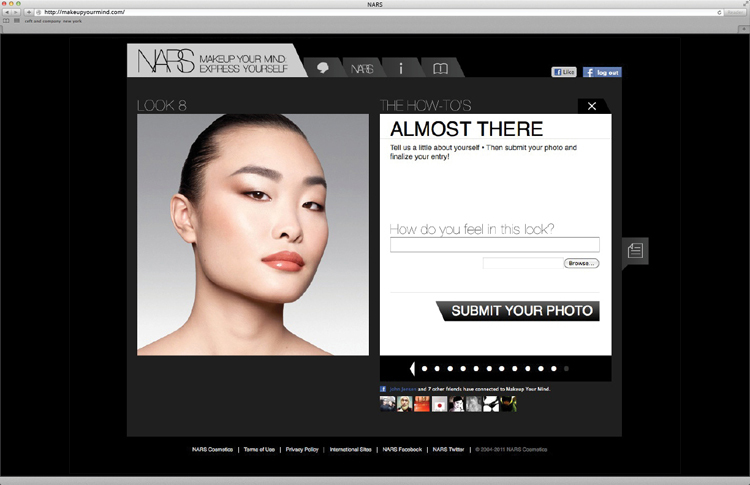 to encourage visitors to try out the products and makeovers, NARS is offering 13 prizes to the women who upload photos of their makeovers to the site. 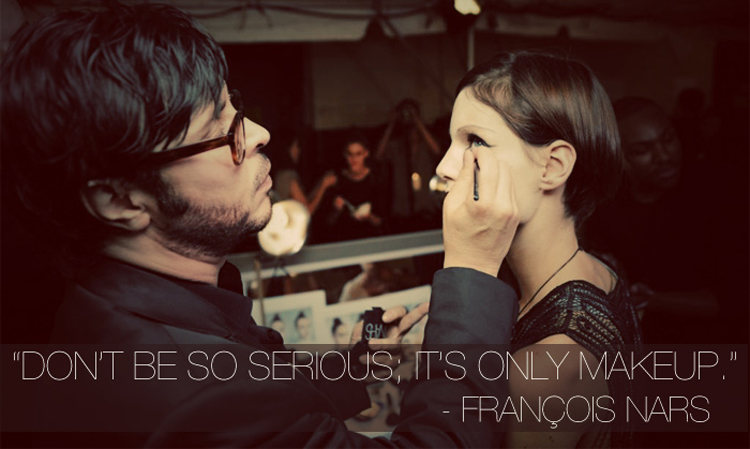 the look with the most votes by august 31st will win a backstage pass to new york fashion week in february 2012, with travel accommodations included. the contest not only promises to increase engagement on the site, but also creates a rich resource of user-generated imagery. 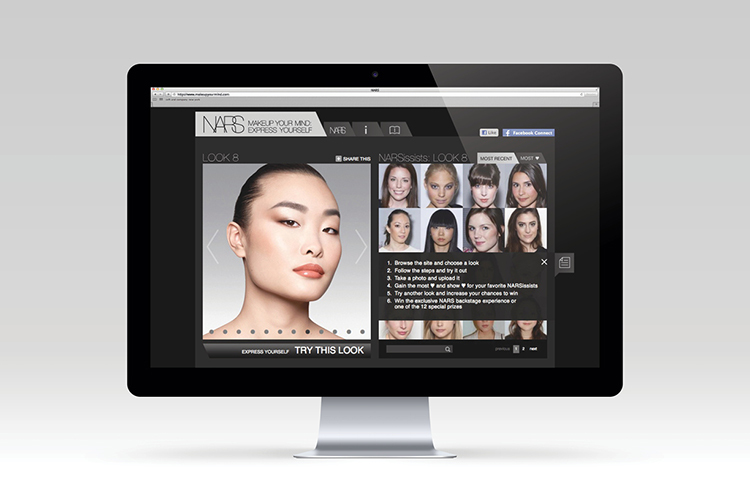 it gives visitors an idea of how featured makeovers will appear when applied by less expert hands on a variety of complexions. 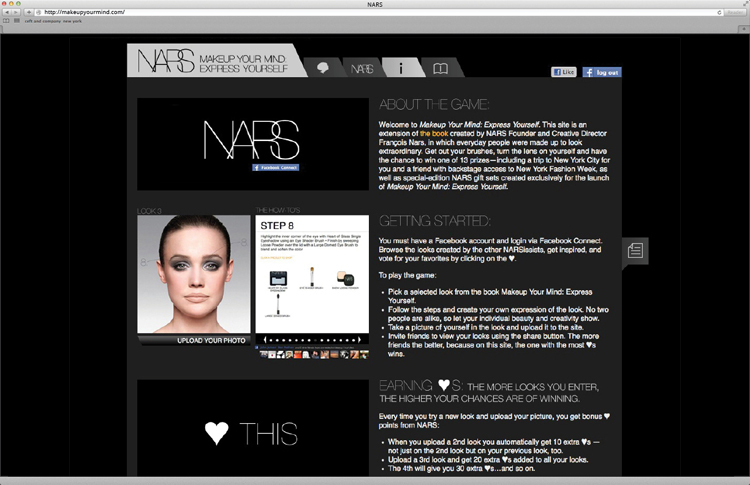 the luxury site features heavy facebook integration throughout. 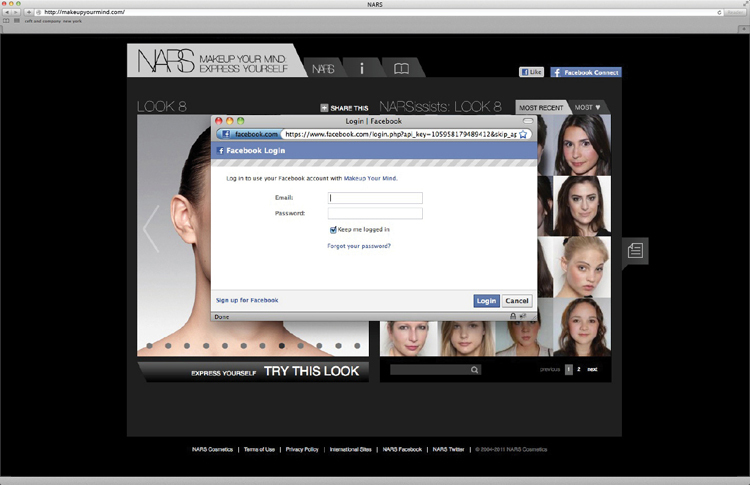 one must login to facebook to vote and comment on looks, and users are somewhat frequently prompted to share content with their facebook friends. 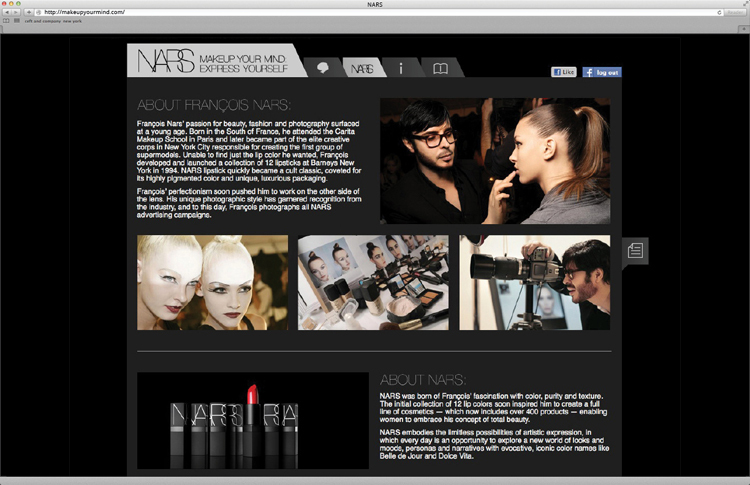 when asked why NARS created a separate site for the experience rather than building it directly into facebook, ucef hanjani, creative director of ceft and company had this to say: “it’s always important for a certain brands to maintain and control their own aesthetic and feeling” — a complaint often expressed by fashion and beauty brands that want to use social media but don’t want their content to sit under a facebook or youtube logo. view all work related to this project.